Join IRADAC on Thursday, February 2, 2012 for a special concert- Black Women in Jazz. The evening will feature the music of Nina Simone, Abbey Lincoln, Dinah Washington, Shirley Horn, and many others. Aziza, composer of Natalie Cole's timeless 'La Costa', will perform her own original jazz compositions. CUNY's own Dona Carter (MA in Music from Lehman College), will be the host and speaker for what promises to be enlightening and informative evening. 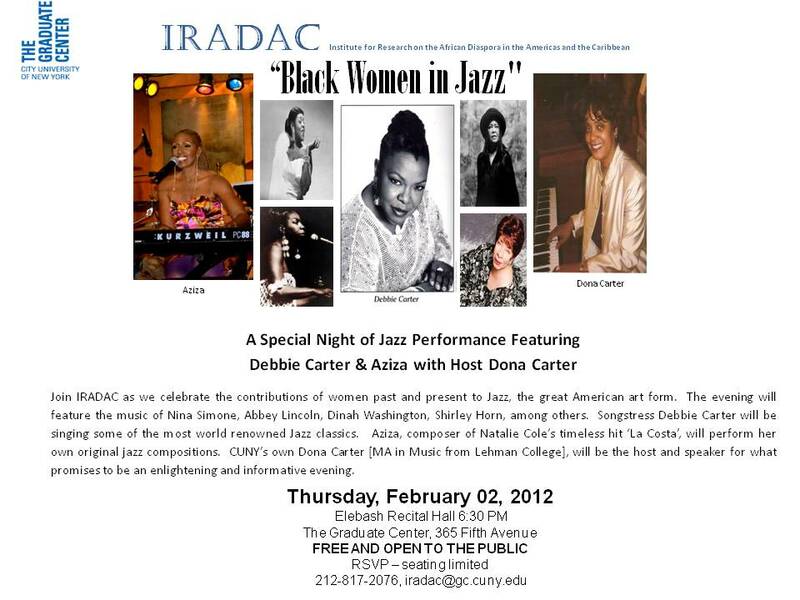 This event is free and open to the public but please RSVP to iradac@gc.cuny.edu or 212-817-2076 as seating is limited.